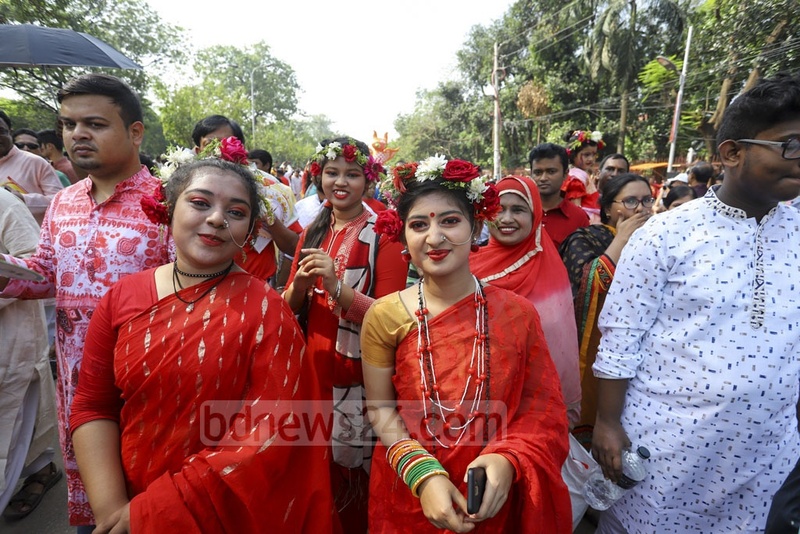 Dhaka, April 14 (newsin.asia): The “Bangla” part of Muslim-majority Bangladesh came out vividly, strikingly and spontaneously on Sunday, when Bengali-speaking Muslims and Hindus jointly celebrated the “Bengali” New Year popularly known as Pohela Boishak or Nobo Borsho. 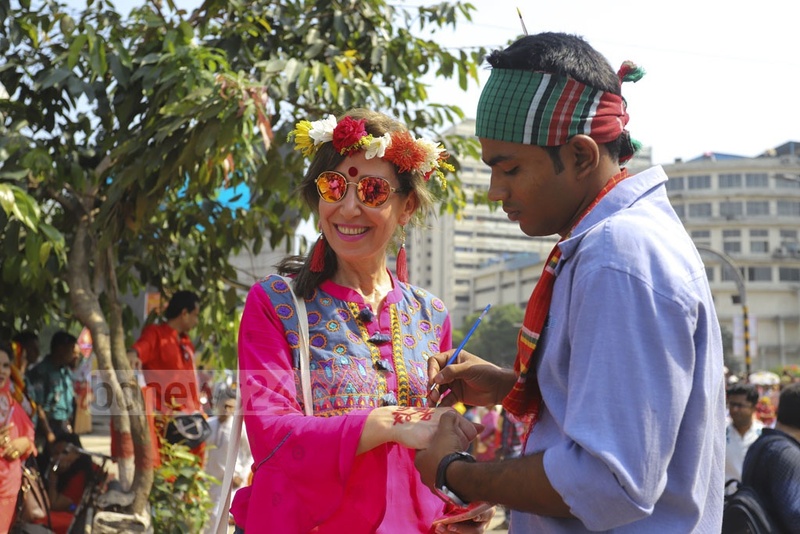 It was a riot of color at the Dhaka University and its environs which were the venues of the celebrations. Women in gorgeous Dhakai cotton saris and Tangail silk saris, decked in fancy jewelry and flowers in their hair, accompanied by menfolk in colorful kurta-payjama poured into the scene of festivities from all corners of Dhaka in their thousands. Perhaps influenced by the Chakma tribes of the Chittagong hills, many women were wearing a wreath of red and white flowers on their heads. The Pohela Boishak is essentially a Hindu festival, but locals told a party of international journalists who had come to see the festivities at the invitation of the Bangladesh Ministry of Foreign Affairs, that only a part of the crowd was Hindus, who are only 10% of Bangladesh’s population. The majority of those in colorful attire were Muslims, who seemed indistinguishable from the Hindus with the women sporting a red mark on their forehead called Bindi which is characteristic of Hindu women. Even the most orthodox Muslim women in the crowd were in colorful chadors and abayas, befitting the joyous occasion. Many even were wearing a wreath of flowers around their heads. But the only thing the orthodox Muslims avoided was the bindi which marks Hindu women from others. The festivities began with a large chorus of women and men dressed in the auspicious colors cream and crimson. They sang Bengali poet Rabindranath Tagore’s songs including “Amar Shonar Bangla” which is Bangladesh’s national anthem. This was followed by Mangal Shobhajatra, a colorful procession of giant art works in clay depicting birds, animals and human faces. The stylized and giant portrayals delighted the young and old alike. Given its importance for the revival of the culture of a people, the UNESCO in 2016 recognized the Mangal Shobhajatra as an Intangible Cultural Heritage of the world. 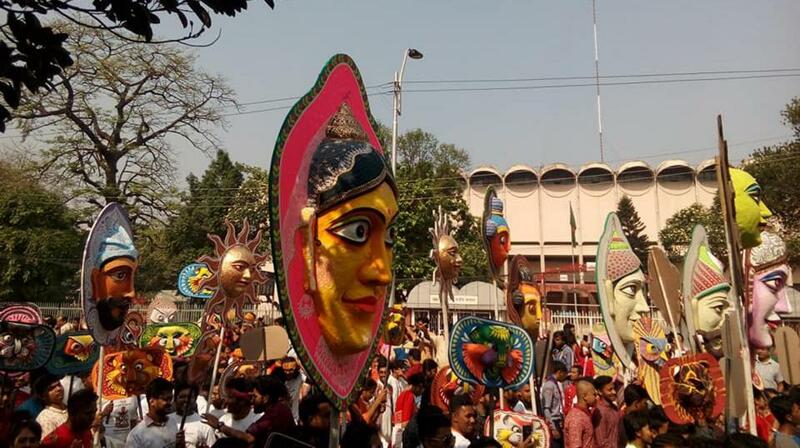 Organized by the students of the Institute of Fine Arts, the Mangala Shobhajatra wended through the streets surrounding Dhaka university. Young men in the procession broke into song and dance. Groups of colorfully clad girls, with a small tray of paint and a brush in their hands offered to paint “Shubo Nobo Borsho” on visitors’ faces and hands . Many seized the opportunity and paid a small sum to the young artists. The Dhaka Metropolitan police distributed packets of traditional sweets and bamboo fans to ward off the heat. Hawkers sold small drums called the dhol which is played during festivals in rural Bengal. All this was done with heavy protection provided by the Dhaka Metropolitan Police whose Kalashnikov toting men were everywhere keeping a close watch on the crowd. The procession itself was accompanied by a huge platoon of police commandos on motorbikes. Heavy police protection was needed because Muslim fundamentalists who dub the festivities as “un-Islamic” and “idolatory” could attack the procession. The Mangal Shobhajatra is free of commercial patronage. It is funded by the teachers, students and alumni of the Faculty of Fine Arts. They raise funds by selling artworks, Sora (items made with clay), masks and crafts which they create themselves. It was in 1989 that the students of Dhaka University first organized Mangal Shobhajatra which literally translated is “auspicious ,beautiful procession”. It was King Shashanka of the Gaur (Gauda) dynasty who introduced to Bengal the solar calendar. As per this calendar, the Bengali New Year fell in the month of Agrahayan. The idea apparently was to celebrate the Aman harvest annually. In the early Mughal or Muslim era, the solar calendar was replaced by a lunar one. Later in this era, Akbar, the greatest of all the Mughal rulers, initiated a reform in the calendar for more efficient tax collection.He reconciled the lunar and solar calendars, making the month of Baishakh replace the month of Agrahayan as the first month of the year. As per the Gregorian calendar which was adopted during British rule, the New Year’s Day falls on April 14. Pohela Baishakh is the first day of the Bengali New Year. Despite changes in the official calendar from time to time, Bengali businessmen continued the tradition of using Akbar’s calendar in which Nobo Borsho or the New Year falls on April 14. Bengali businessmen open new account books on Bengali New Years’s day. In villages all over Bengal, the tradition of heralding the New Year with fairs where local crafts would be sold, has stayed. Performance of the traditional thejatra plays, music and dance performances, kite flying, boat races, and even wrestling, not to mention feasting, marked the festivities. “The uninterrupted celebrations of Pohela Bo ishakh festivities testify to an extended period of communal harmony in rural Bengal. But the brutal incidents hastening partition of India in 1947, made such festivities suspect in the eyes of religious zealots,” observes Fakrul Alam, an academic, in an article in The Daily Star. “But the persecution of Bengali-speakers when the present-day Bangladesh was part of Pakistan, revived an interest in the revival of Bengali culture,” he notes. The Bengali language movement which began in 1952 against the imposition of Urdu when present-day Bangladesh was part of Pakistan, led to the celebration of Pohela Boishak by Bengali nationalists led by the students of Dhaka University as a mark of protest. Dhaka University was then and now, the nerve center of Bengali consciousness. “It was a vibrant collective and spontaneous response to the damning of Bengali nationalist consciousness by successive Pakistani military governments working in cahoots with Muslim League politicians. 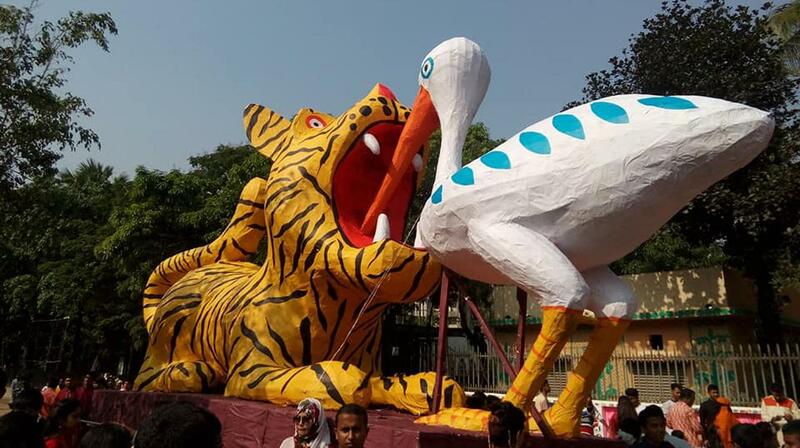 Pohela Boishakh, therefore involved a reclaiming of the past for Bangladeshis who wanted to have none of Pakistani machinations designed to consign Bengali cultural markers out of sight forever,” Alam adds. “Consciously or unconsciously, the Pohela Boishakh events, revived in Bangladesh from the mid-1960s, were designed to assert Bangaliana—Bengali identity—and were meant to assert the Bengalis’ rootedness in this part of the world,” Alam concludes.